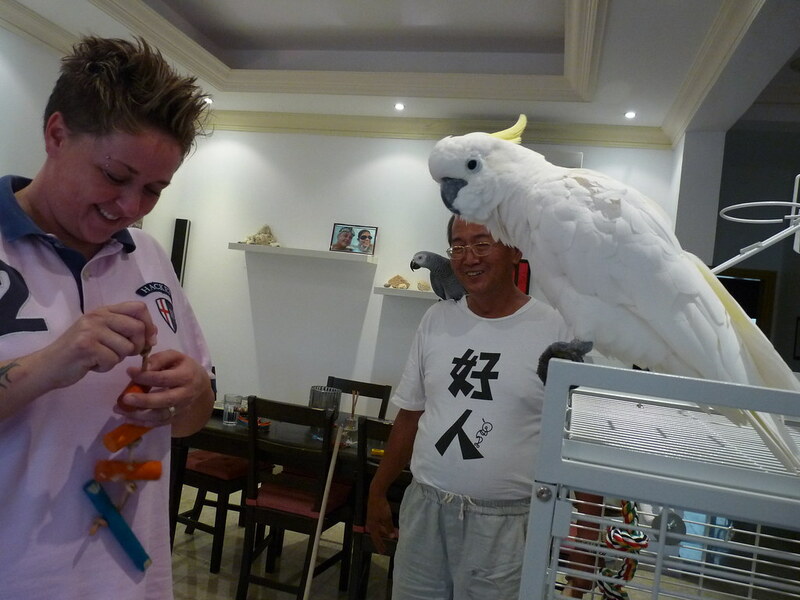 Al Falaj again//Meeting Max //Sailing regatta Extreme Sailing Series Asia. 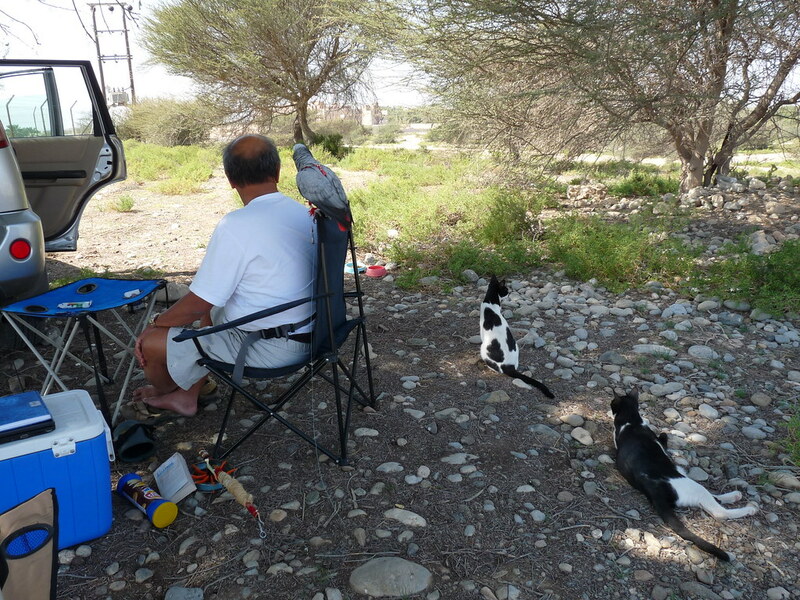 more photos in flickr folder "Al Felaij Dam with Kattie & Dommie"
We enjoyed the trip to Al Falaj dam 2 weekends ago even if Dommie did not come with us then. Katie must have boasted to Dom of that trip. To the point Dom became paranoid of being left out. A few times when I and my wife got into the car, Dom jumped in with us. When we opened the rear door to get him out, he would jump over into the boot. And if I opened the boot door, he would jump over the seat to the back of the car. And if my wife and I cornered him, he would cling on , front legs stretched out and claws sunk in hugging the seat to make his removal difficult. On Thursday morning, spring was still with us with morning temperature at 16 C and temperature at low 20 for the rest of the day. This year, the winter here was more chilly than last year. 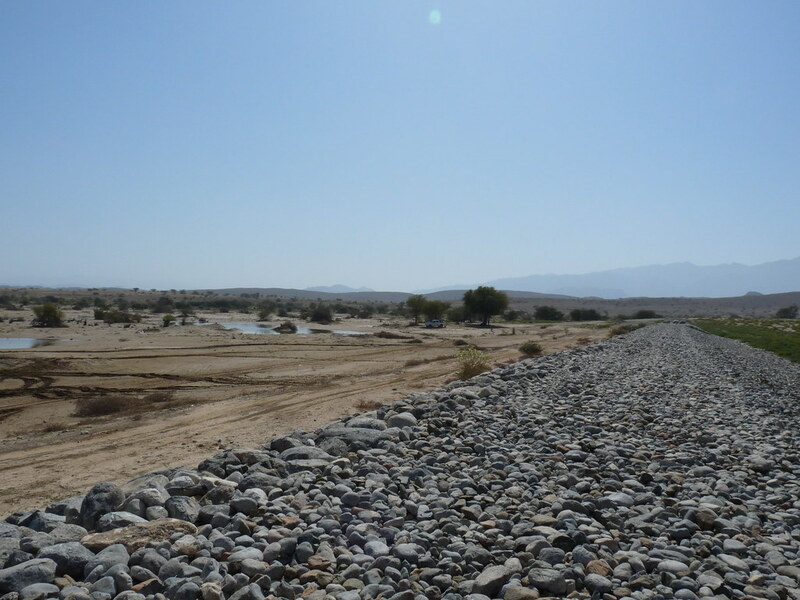 As spring will not remain with us much longer and in time the heat of summer will be with us again, we decided to go to the Al Falaj dam just half an hour drive away from home at ten am. We found other people were there under the tree we were at that last time. 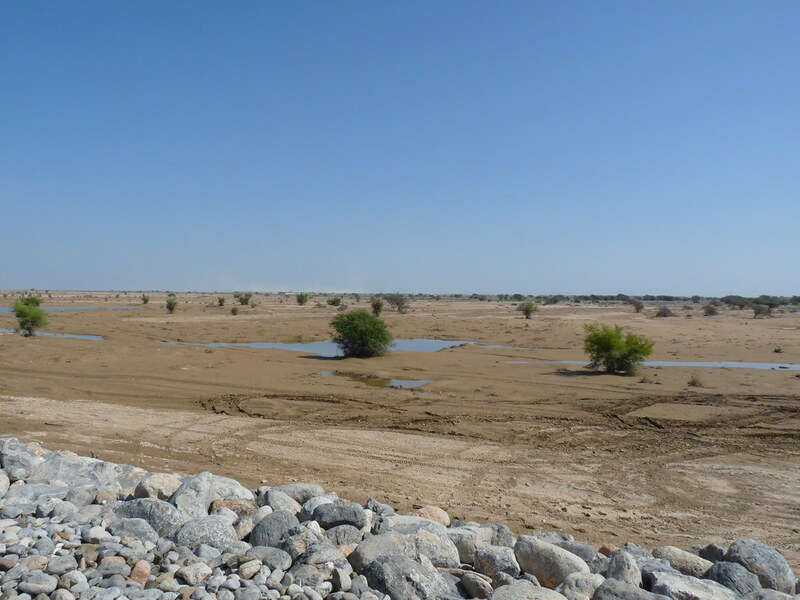 The water had largely disappeared. There were only a few scattered pools left. The flock of water birds that wheeled about gracefully in the air or feeding at the water edge had gone. We decided to go to the other place on the knoll near the dam. That place where Katie threw her tantrum the last time. I found my kitties did not get along well with people who might have kids throwing stones at them. 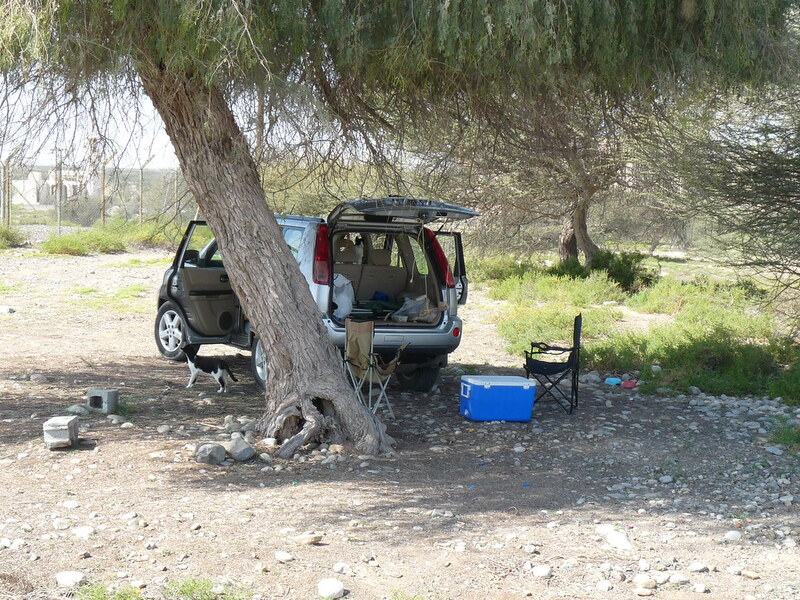 After I set out the base camp, another 4-5 cars came and went to that tree below. They must be having a party. Good for them. What is the point of living if you do not go and enjoy your being alive. Katie was still meowing, even though Dommie was with us this time. So perhaps that last time, she was not pining for Dom as I thought. Those two generally go their separate ways. Katie preferred to remain around me or inside the car while Dom would periodically disappear to do his explorations. I did not feel comfortable doing free flights at this place. I could say there well changes of elevations making it difficult to run after Riam should Murphy say hi to us. The good area must be good 360 degrees all around. It ain’t going to be good if you have a vast plain next to a river, or a busy road. Your bird might fly over that river or that road instead of to that vast plain that you can chase after. But the truth was that my gut feel was not good for that place. At the end of it, it is your gut feel. And your gut feel better be good. You recalled in the free flight at home, I decided to shift away from the front door to the patio area with the car porch. I wrote it was because of some birds who were attracted by the ‘kitchen midden’ my wife established in that patch of garden. I decided to shift to the patio as patio provided some overhang together with the car porch. Riamfada had been looking right and left that time at the front door of villa after her flight to me. I felt in my gut that I better shift to the patio. You seen that ‘I am curious’ flight Riamfada did after we shifted there, nicely controlled by roof overhangs. Of course, Riam could easily have flown up into the blue sky and over the garden wall too. Even though my wife wanted to stop after Riamfada did her impromptu flyabout flight, I continued on with yet another recall with Riamfada flying through that open door to me. I felt her curiosity had been satisfied and she would be nice with me after that. 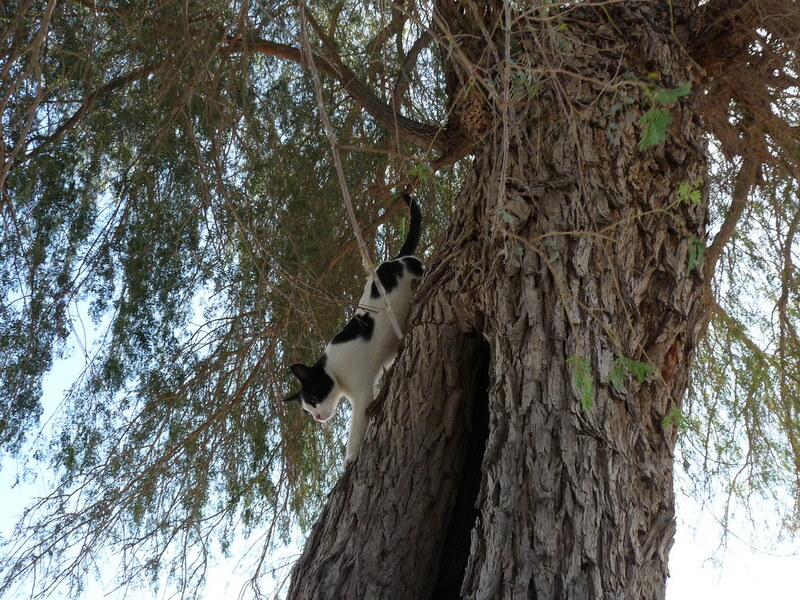 In Al Falaj that morning, I just wanted to enjoy that outing with snacks, drinks and a book. Riamfada was always content to be near me whether her leash was on or not. She periodically flew from her perch to my shoulder or onto my knee. With her leash on, I could relaxed that much more and not having to remain focused entirely and intensely on her. We had our lunch and then at about 230 pm, we headed home. 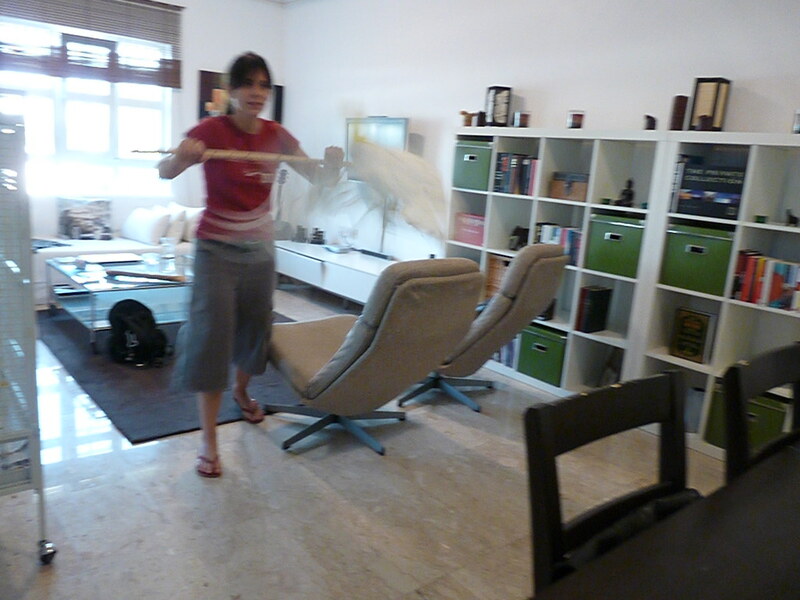 more photos in flickr folder "Visit to Kerry Valia & Max "
That was to drop the kitties back at home. And to pick up 3 packs of Tinkerbell Mash Batch 7, 2 still frozen and the other bag thawed. We were to go and drop in on Max. 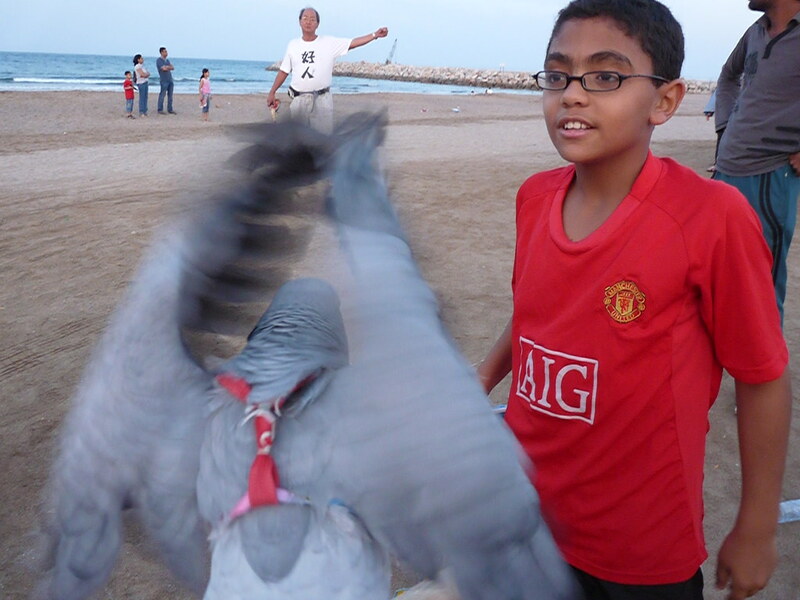 A fellow blogger from muscat ( hugely popular blog i would say ) http://eternally-distracted.blogspot.com/ has a bird. She recently had trouble with the bird flying away and all that stuff and she is considering clipping the birds wings for its own safety, I directed her to your husbands blog and she is very much excited. She would like to let her bird fly on a leash and she has no clue how to do it. Would you be kind enough to help her?. Can i forward your name,email and number to her ?. May be you could ask her to come to your supperclub first as i dont know much about her other than what i read from her blog. She is from scotland i guess and her name is kerry. I am forwarding this directly to you. A very important part to read will be 'cargo cult' in one of those embedded URLs. You will understand when you read that. I think those photos will establish my credentials, and might give you very nice surprise. Read that part 'Tinkerbell Harness for Piper' and all the URLs inside , as well as the URLs embedded in those URLs. I think your friend will get more answers even to questions he had not even thought about. Tell her to write to me directly on any questions. and asked if she liked a few packs of Tinkbell mash as well. She said yes and so Max will now have Tinkerbell mash in his diet as well. Max was in his cage when we reached there. I told Kerry it was better that way to introduce ourselves and let Max got used to us first for a few minutes. Max had one of the largest cage I seen in Muscat. With toys, mix of dry seeds, a bowl for salad for him. It was clear Kerry & Valia love Max very much. Max love women. He almost immediately allowed my wife to rub his head. I sensed his preference did not extend to me. That was ok with me. Max did not like stick very much and reluctant to step up. They had bought a clicker. With what I had written, they should be able to get Max to do a lot of stuff and interact so much better. With Max fed on the mash, they will find the seeds Max love most and can use that to condition the clicker and go on to the rest of the training. I told them clicker training was the foundation of what they had seen of my relationships with Tinkerbell, Yingshiong and now with Riamfada. Eventually Max will be happy to step up on sticks of different sizes, learn to fly better and to fly at recalls and get used to harness & leash to be taken out safely. Even more important, they all will have a lot more fun together. Valia showed me in their kitchen all the beans they had bought as advised in Tinkerbell Mash Batch 7 but could not find brown wheat berries /oats/barley. I think the shock of seeing how that mash was done was enough to send Kerry and Valia into a shopping frenzy for beans and stuff for that mash. 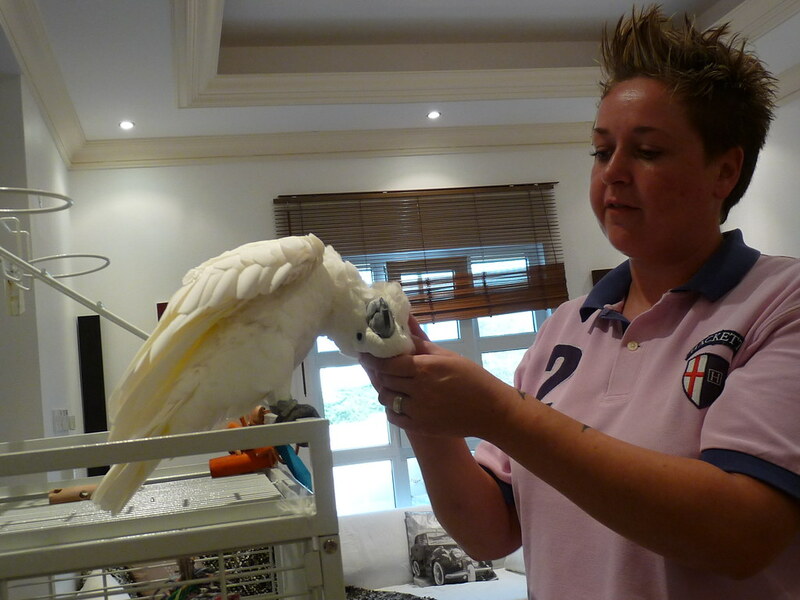 No other commercial parrot food in the world can match Tink mash prepared with love and care. I told them the cereals that they were searching for could be found in the organic shop at the basement of Al Masa shopping center at Al Shatti district. It was a delightful afternoon we spend there. Riamfada flew about inside their living room when I was outside having a few ciggies. We talked and talked. Time passed too quickly and we had to go. 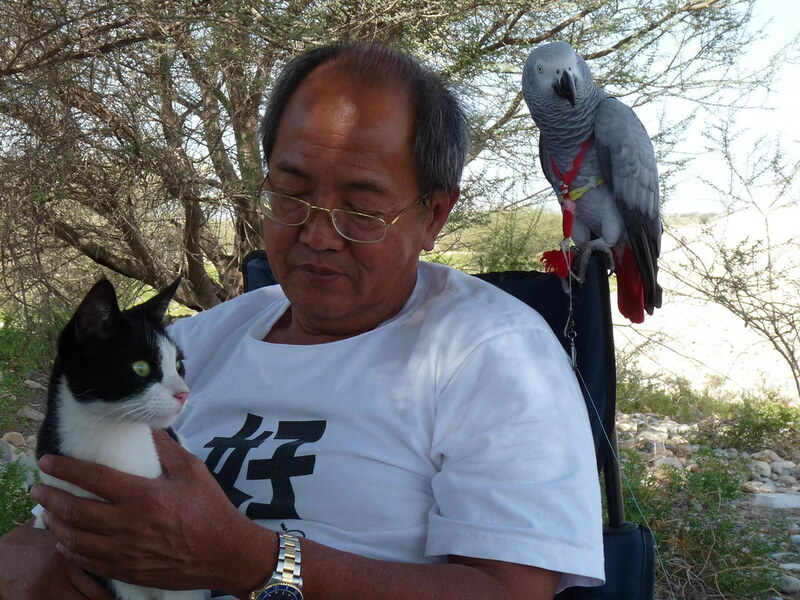 Max is indeed lucky to have found a home with them and will bring magic into their lives. 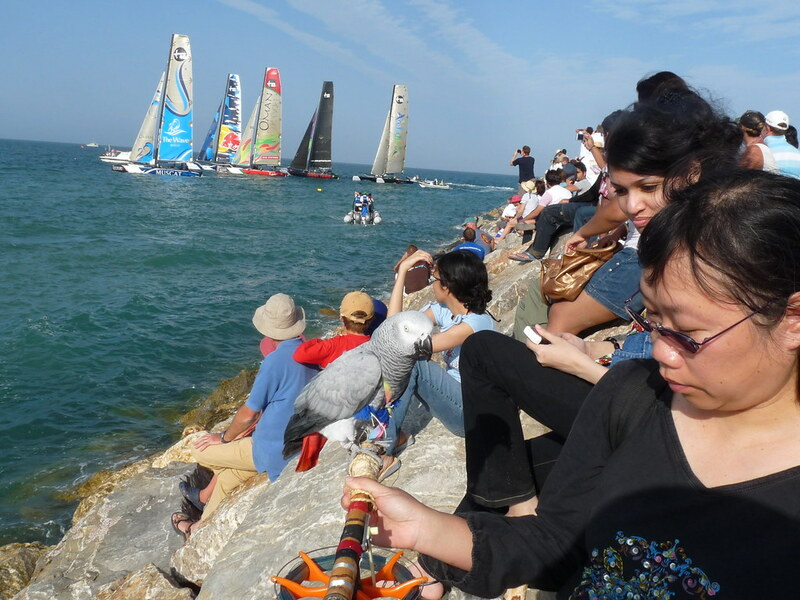 Sailing regatta Extreme Sailing Series Asia. more photos in flickr folder "Extreme Sailing Asia 2010 "
On the way back, we passed by the ‘Wave’. We knew the Extreme Sailing Series Asia was taking place there. I used to do a lot of sailing from the time I started in early 1970 with Snipe, Lark , Thunderbolt and Cat. I love the wildest winds to go out in. I laughed at the rest of the world when out on the water in Force 7 winds and stronger while less crazy sailors were downing their beers on shore in the clubhouse bar. Then when windsurfing came in late 70s, my weekends all evolved around that. Ok, when there were no winds, we played lots of darts in the clubhouse. I used to beat them all in chess with me playing chess sight unseen of the board against them collectively. Then they realized my play was inversely proportional to the beer I drank. But then, with enough beer, it did not matter if you win or lose. When the winds came, I was out on the water with others, just thoughts alone , skimming on the water , bending the waves and the winds to our wills like demigods. I stopped sailing 20 years now. But I still love that sport. The races ended for the day. We were there the next day. There was a big crowd there. We went onto the breakwaters of the ‘Wave’. Riamfada took the crowd in her stride. She was watching the race with us all. To see duels of the catamarans as they tacked to the windward mark and fighting on the course. 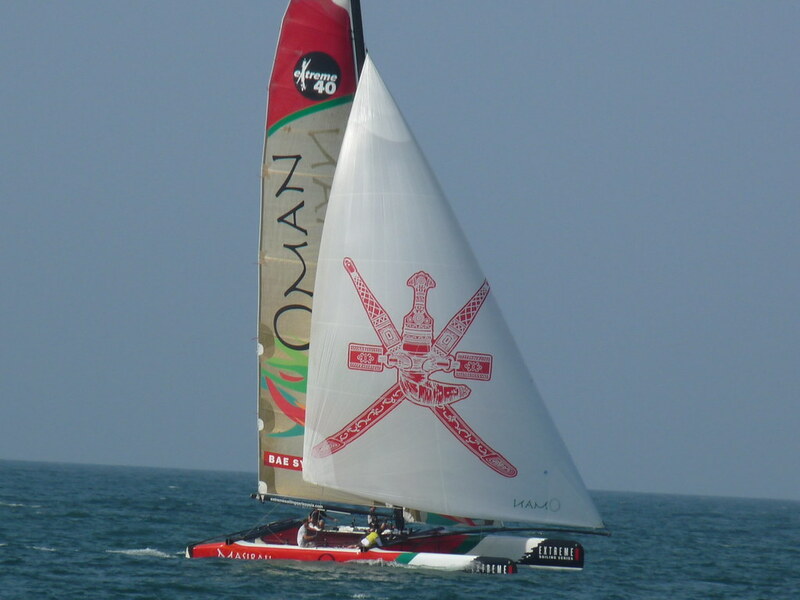 And to see Oman Sail Masirah winning the regatta. 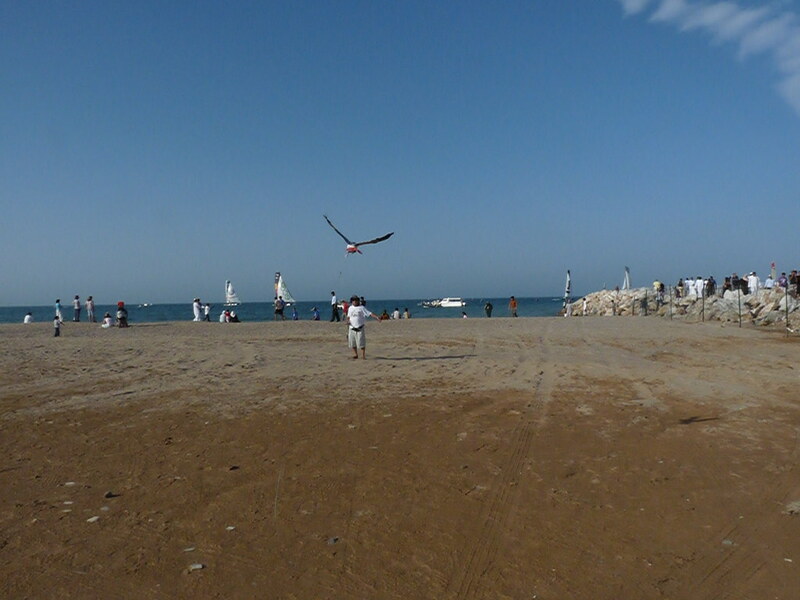 Oman has a very long tradition of sailing long before Europeans set out on the sea. Oman was the seafaring link between the Far East and her spices and silks to the Middle East and hence to Europe. I do hope to see Oman sailors going to conquer even greater heights. Maybe one day, Oman will be the home of the great American Cup.